Have you ever wanted to venture into the depths of the jungle? Well now you can safe from the comfort of your own home with this NetEnt epic jungle adventure. Jungle Spirit: Call of the Wild is waiting for you to uncover the treasures waiting within. But dare you tread where the tigers and crocodiles live to gather your riches? 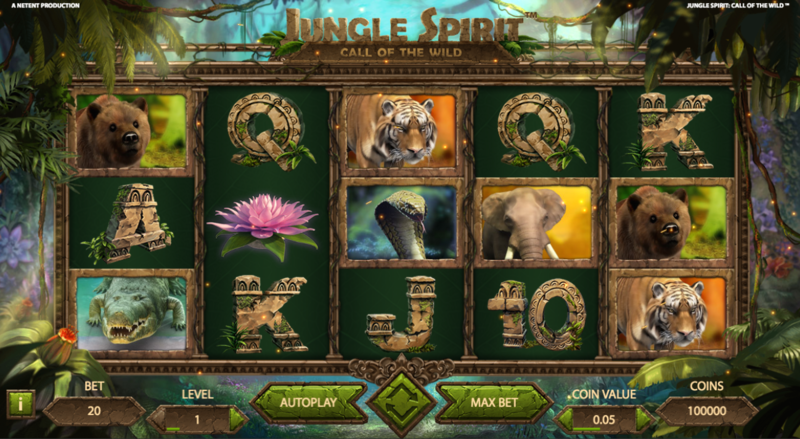 Jungle Spirit: Call of the Wild is a 5-reel slot offering 243 ways to win and an RTP of 96.47%. If that isn’t enough to get you donning your adventurers cap we don’t know what is? We love the mini animations in play as winning combinations are formed. Those reels hang as if left behind from some ancient civilisation in the jungle canopy and you can hear animals and birds in the soundtrack, which is actually quite relaxing to listen to. Bet Amounts – Betting begins at 20p per spin and can be adjusted up to a maximum of £50 per spin. To adjust your stake, you can change the coin level or the coin value. These are found to the left and right of the spin button and have arrows on to increase or decrease the amount to suit your needs. Wild Symbol – Jungle Spirit: Call of the Wild has no wild symbol! Shock horror, we know its not usually the case for NetEnt games. But fear not you do still have a scatter and plenty of other bonus features to make up for having no wild. Scatter Symbol – A pink flower is your scatter symbol, it almost looks like a lotus blossoming when animated. Land 3 or more of the flower scatter to trigger the bonus spins feature. Symbol Expansion Feature – Whilst the reels spin you may notice that some of the symbols have a glowing ring and butterfly around the edge? If you land a winning combination and the symbol with the glowing edge is part of it, then it will expand. It will expand to fit the whole reel and thus help create more wins across other reels. This feature is available in the main game and the bonus spins feature as well. Butterfly Boost Feature – In a similar nature to the symbol expansion, the butterfly boost also helps to expand symbols. At random you will see butterflies fluttering across the screen, they will land on symbols that form part of a winning combination. Any symbol they land on will expand across the entire reel helping to create other line wins. This feature is only available within the main game and not the bonus spins. Bonus Spins Feature – After landing three or more of the pink flower scatter symbols you will enter the bonus spins feature. You will now be given the choice of one of the animals from the game itself, each one having a selection of spins allocated to it. Cobra will allocate 20 bonus spins. Choose your animal wisely as each one will have a different win potential attached, the higher the spins the lower the win amounts and vice versa. Your chosen animal will appear more often within the spins so again choose wisely. Jungle Spirit: Call of the Wild doesn’t top there though, you will see an additional row has been added to the reels extending the win lines to 1024! Also, trigger the feature with 4 or 5 scatter symbols to win an additional coin win on top of triggering the bonus feature! Well, how about all of that then, are you ready to go trekking into the jungle, we are! NetEnt have outdone themselves with this one. We didn’t even notice the absence of the wild symbol because there was that much going on. Jungle Spirit: Call of the Wild has absolutely wowed us, wins are triggering everywhere and once inside the bonus spins are even greater. Overall an exciting, fast paced game with lots of things happening to keep your interest going.